Hair Genesis has been tested both in open-label clinical research as well as double-blind, placebo controlled study. A manuscript describing results from the double-blind research has been submitted for publication within a peer-reviewed scientific journal and is presently under editorial review prior to acceptance for publication. Hair Genesis™ was designed with the understanding that individual botanical substances have previously demonstrated real benefit against hormonal disorders that also cause hair loss. In developing these oral and topical agents, a regimen has been developed which is unique in design as well as effectiveness. For those wishing to develop a deeper understanding of the details involved in this subject, we have provided a selection of relevant data supporting the safety and efficacy of Hair Genesis™ as observed within two open-label clinical studies. Twins Prove Hair Genesis Works! Results show difference between identical twins, one treated with Hair Genesis for approximately six months vs. his untreated identical twin brother after the same time period. Hair Genesis serum is the external component of the system. Apply directly to the scalp for intense, direct DHT blocking at the source. Package: 1 Oz for one month supply. category. It is also much more convenient to use. drug-delivery system wherein key naturally derived active ingredients are efficiently delivered to targeted structures within the hair follicle. Serum in combination with Hair Genesis® Oral Softgels and Hair Genesis® Revitalizing Shampoo. Hair Genesis Topical Activator Serum has also been dramatically improved. In a newly designed proprietary solution, Hair Genesis Topical Activator Serum is bristling with a host of potent 5AR inhibitors, yet free from the negative side effects commonly associated with prescription medications. Hair Genesis Topical Activator Serum is safe, effective, and now - even more powerful than ever before. Borage Officinalis Seed Oil, Macadamia, Ternifolia Seed Oil, Thioctic Acid, Biotin. Directions for use: Apply 1 ml daily to thinning hair areas. HairGenesis® Oral Softgels can be thought of as a super hair vitamin. Via a patent-pending invention, incorporating a novel combination of thioctic acid and a patented form of acetyl L carnitine, coupled with LSESr and betasitosterol, new Generation IV Hair Genesis® Oral Softgels go where no hair loss treatment has gone before. This is so because based on newly published research, HairGenesis® now reduces inflammation in the hair follicle while blocking the negative effects of 5AR. This one-two punch constitutes a unique dualmechanism of activity in combating important aspects of hair loss pathology. Newly formulated with a powerful suite of naturally deved substances, Hair Genesis® Oral Softgels are clinically shown to inhibit the problematic metabolic events linked to the onset and progression of pattern hair loss. While positive benefit may occur in as little as four to six weeks, a three month period of initial use is strongly recommended before attempting to evaluate your results. Hair Genesis® Oral Softgels are produced in an FDA regulated, pharmaceutical-grade manufacturing facility under the highest cGMP standards. This proprietary composition has been shown to be safe and effective when taken as directed, presenting no evidence of negative side effects or drug interactions whatsoever. For optimal results use Hair Genesis® Oral Softgels in combination with the entire Hair Genesis® Treatment Regimen. Package: 30 tablets/bottle for one month supply. The Hair Genesis™ New Maxmium Strength Oral Softgel ™ is a critical component of the Hair Genesis™ system. Hair Genesis™ Softgels are designed to be taken orally and work in conjunction with the Hair Genesis™ Product Line. Building on the success of the foundational formula - and after years of follow up research - the Hair Genesis™ Oral Softgels have recently been dramatically improved and now provide a suite of newly recognized botanical substances that work together to strengthen and protect your hair better than ever before. While results from Hair Genesis™ have been reported in as little as two months, a six-month period of use is strongly recommended in order to assess the benefit Hair Genesis™ is providing. Directions : Take one softgel daily. New Generation IV Hair Genesis® Revitalizing Cleansing and Thickening Shampoo is a very special hair care product designed to prime your hair for maximum growth potential. Containing the same patent-pending active composition found in the topical serum and softgels, new Maximum Strength Hair Genesis® Hair Thickening Shampoo is the one to use for those wishing to achieve maximum results. Your new Generation IV Hair Genesis® Revitalizing Shampoo has been enhanced with a host of modifications designed to improve the health and vitality of your hair. The active composition contains patented substances that have shown benefit in reducing key markers of inflammation in a well-respected analog of hair follicle biodynamics. Further aspects of the formula have been shown to reduce lipid-peroxidation, a factor linked to cell death in the hair follicle. New Generation IV Hair Genesis® Revitalizing Shampoo is an important part of the Hair Genesis® regimen. Use this powerful shampoo three to four times weekly and watch your hair display a renewed fullness and vitality that you will enjoy every time you glance in the mirror. Package: 8 Oz. per bottle for one month supply. Hair Genesis Hair Cleansing Formulation contains a suite of the key components found in the oral formulation that have been shown to block DHT from binding to the hair follicle. By incorporating this hair-cleansing product into your Hair Genesis treatment program, you'll maximize the benefit of Hair Genesis by attacking DHT both orally and topically. Research indicates that DHT is not only found within the hair follicle, but also at the base of the hair shaft. By using the Hair Genesis Hair Cleansing Formulation, this harmful DHT can be removed before it has a chance to cause damage to your hair. Betine, Cocamide DEA, Glycol Stearate, Hydrolyzed Glycosaminoglycans, Hydrolyzed Wheat Protein, Saw Palmetto Extract (LSESr), L-carnitine, Beta-Sitosterol, R-thioctic acid, Borage Oil, Evening Primrose Oil, Prunus Africana Bark Extract, Camellia Oleifera Extract, Biotin, Phenoxyethanol, Citric Acid, Sodium Chloride, Methylparaben, Propylparaben, Fragrance, FD&C Yellow #6, FD&C Blue#1. Apply a small amount to wet hair and gently message into the scalp. Leave on hair for 3-5 minutes and then rinse hair thoroughly. NEW MAXIMUM STRENGTH FORMULA: Enhanced Performance Characteristics Patent Pending Hair Genesis® Revitalizing Conditioner formula designed to: protect weakened hair by preventing ROS damage, cytotoxicity, genotoxicity and apoptotic cell death in susceptible follicles. & facilitate intramitochondrial transport of fatty acids for beta oxidation an important function in hair follicle energy metabolism -- a system which is one of the most robustly proliferative and energyintensive structures in the human body. An added bonus to the Hair Genesis® system is the brand new Maximum Strength Hair Genesis® Revitalizing Conditioner. This wonderful product, designed to be used two or three times weekly has been specially formulated to make your hair look and feel its healthiest and most vibrant. Hair that has been affected by pattern hair loss is often weaker, duller and finer than healthy hair. Hair Genesis® Hair Revitalizing Conditioner is a finishing product that has been specifically designed to protect and strengthen your hair so that it always looks its best. To achieve best results, always use Hair Genesis® Conditioner in combination with the entire Hair Genesis® Treatment Regimen. Aside from making your hair feel fuller and more luxuriant, your new Generation IV Hair Genesis® Revitalizing Conditioner works hard to protect hair that has been weakened due to the erosive effects of pattern hair loss. By incorporating substances that have been shown to prevent damage by reactive oxygen species, and cell damage in susceptible hair follicles, new Generation IV Hair Genesis® Revitalizing Conditioner represents a wonderful component in the treatment regimen. Like the Revitalizing Shampoo, new Generation IV Hair Genesis® Revitalizing Conditioner is an important part of the Hair Genesis® regimen. Use this powerful conditioner two to three times weekly and you will begin to see just how healthy, vibrant and strong your hair can become. Hydrolyzed Glycosaminoglycans, Hydrolyzed Wheat Protein, Saw Palmetto Extract (LSESr), L-carnitine, Beta-Sitosterol, R-thioctic acid, Borage Oil, Evening Primrose Oil, Prunus Africana Bark Extract, Camellia Oleifera Extract, Biotin, Nonoxynol-10, Phenoxyethanol, Quaterium 15, Citric Acid, Fragrance, Methylparaben, Propylparaben, FD&C Yellow #6, FD&C Blue#1. Shown to inhibit DHT metabolism? Free from known potential side effects? Maximum Strength Product Suitable And Available For Both Men And Women? Available in both Oral and Topical Formulations? 12 Month 100% Satisfaction Money Back Guaranteed? Demonstrated safe and effective under placebo controlled, double blind IRB clinical research? Peer reviewed published IRB research? *The above comparison was derived from publicly available data and is not intended to verify or dissuade any claims for any product other than Hair Genesis™. Hair Genesis™ is a non-drug hair loss treatment product to ever demonstrate safety and effectiveness in stopping pattern hair loss (in both men and women) and supporting hair re-growth in an independent clinical study under FDA regulated IRB (Institutional Review Board) peer-monitored, placebo-controlled, double-blind research. This study was published by The Journal of Alternative and Complementary Medicine, a highly esteemed medical journal. Hair Genesis™ is safe for both men and women to use. All four Hair Genesis™ products contain DHT inhibitors (DHT blockers) and are supported by a 100% satisfaction guarantee. 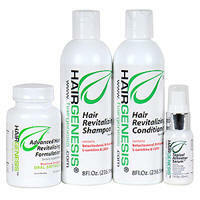 We offer the lowest price for all Hair Genesis™ products. The positive results obtained from all the scientific evidence we've presented so far can easily be appreciated. Read how Hair Genesis has been an effective hair loss treatment to these people with thinning hair and hair growth problems! Actual letters about hair loss problems and thinning hair, and how Hair Genesis is a hair loss treatment that really works. I used your product before; and after about 9 weeks I started seeing results. Your product continued working great for me but I discontinued the product after I achieved the results desired (about 9 months). Now my hair has started to thin again so I know this time I will not be discontinuing use of Hair Genesis. This product works great for me because I am in the military and don't always have time to get in front of a mirror and spray stuff (Rogaine) on my head. Also (Rogaine) was only growing fuzz but the Hair Genesis was really thickening up the hair I had and also growing new, thicker hair. I guess the only thing I would request now is to please get my order to me ASAP. Also, last but not least, thanks for a convenient product with no side effects. "..my hair growth has been fabulous!" I have had a hair loss pattern that started in my mid-twenties (front through crown). Since I started using HairGenesis™, my hair growth has been fabulous!I have a lot of hair growing on the top, center portion of my head now. My hair loss has also become very negligible. HairGenesis™ has also almost totally restored my hair loss. I would and have recommended this product to others and friends--and I am a very strong believer in the results of this product. "I have never felt better about the way my hair looks than now!" I would like to thank everybody at HairGenesis™ for giving me back my hair. For years I have had to live with the fact that I was losing my hair and that caused great depression. I have never felt better about the way my hair looks than now! I can now wake up in the morning and not have to spend hours on my hair trying to make it look fuller. Being a woman and losing your hair was the most horrible thing ever! Thank you again! "..no hair in my brush and none on my pillow." I started using HairGenesis™ when I noticed more hair in my brush than I thought was normal--also on the shower drain. Since I have been using HairGenesis™, there is virtually no hair in my brush and none on my pillow. I have not seen any hair on the shower drain after a couple of weeks after use. I will not stop using something that works. My hair in front only looked good combed back to cover my bald spot in back. My hair would not grow long and healthy enough to wear bangs. After using HairGenesis™, my hair stayed healthy so I could grow some length to wear bangs and cover a once rather balding area on the back. I believe HairGenesis™ prevents future loss by keeping the hair healthier thus giving hair density and length to wear bangs. The body and health of my hair have improved. "..I have little hairs growing on top of my head." I was concerned with the loss on the crown of my head and I wanted to slow it down. Once I started using HairGenesis™, I noticed very little hair loss (after showering) and it seems I have little hairs growing on top of my head. I really think this product works and I would recommend it to others. I have being using HairGenesis™ for over six months. It works! I wish I could tell every person with thin hair to use this. It would make lots of people very happy. Even my barber has noticed the change. He commented on how much my hair filled in the area of most thinning. "I heartily endorse this all natural product and recommend it to all my patients. Almost 90% of patients using the formulation noted a complete arresting of their hair loss progression." After researching the various treatment options available for androgenic alopecia, it is my opinion that only three classes of substances have been clinically proven to prevent and/or reverse hair loss: minoxidil, Super Oxide Dismutase, and the antiandrogens. I have reviewed recent studies of HairGenesis and noted a very high success ratio. Almost 90% of patients using the formulation at the recommended dosage noted a complete arresting of their hair loss progression. Of these patients, 50% demonstrated an "aesthetically meaningful" change in the caliber of their hair. These are very positive findings indeed. After reviewing this research as well as clinical notes taken from patients followed at Advance Restoration Technologies, I am comfortable this formula presents an extremely safe track record in those using the product formulation at recommended dosage levels. These facts impressed me. HairGenesis is an exciting, new, naturally based, antiandrogen that has been added to our medical armamentarium for hair loss prophylaxis. "My hair is rejuvenating in leaps and bounds. My confidence is back and so is my hair!" Dear Sirs and Ladies (of course), I made a fool of myself the other day on the phone with the president of your telemarketing firm. I decided that no matter what, you must hear my story. I decided that I am definitely female and you need to hear my roar. I was beginning to wonder about being female with all the hair I was losing. I have always been considered a very attractive female and my hair has always been my crowning glory. My smile, personality, shy look are all contributing factors to my success. Not many women are able to say that they have broken a six-figure income. I can. I always feel in control. Okay, not always. When I realized that I was losing my hair I couldn't believe it. First, I ran out and bought every expensive product on the market thinking that the health of my hair could be affected. Nothing worked. I tried to ignore the problem thinking that stress was the culprit. So, I quit the stressful job and moved to the country. Really. My God, it just got worse. It got so bad that I could feel hairs dropping onto my arms when I was sitting perfectly still. That was when I finally admitted that there was a real problem. Off to the doctor I went. By the way, I quit my profession (marketing) and lost my insurance. Hundreds of dollars later and many tests and three doctors later and I was sadly disappointed. After the tests they decided that my testosterone level was normal, yet high normal and that was the problem. They placed me on birth control pills (don't need - had surgery) and blood pressure medicine. I took them faithfully for months. Nothing. I was losing so much hair that after vacuuming my vanity table area the vacuum quit running because of my hair wrapped around the roller. What a nightmare. I cried. I lost more hair. One night my husband and I had a tiff (this was happening more often I think due to my loss of hair and self esteem) and I went to my mother's. She has cable. I saw your infomercial. I thought what could I lose? Just more hair. And the rest is her story (it's a girl thing-instead of history). Within three weeks of use I could comb my hair and not lose a single one! Within three months now my hair is rejuvenating in leaps and bounds. You should see all the new growth on my gorgeous head! My confidence is back and so is my hair! My existing locks are getting shiny, and silky and I have baby (2") hairs all over my head! Your product is saving my life as I have known it. This, of course, is not the whole story as I have toooooo much to tell. I love you whoever you are. My thoughts? You should love me too. I could help open an entire market for you with the women. I walk through the stores and notice all the thinning heads of women. My heart weeps for them. I want to sit with Jenny Lee Harrison on your next infomercial and tell all the women on earth that you're the best. Maybe even the only. You need to get pictures of my hair!!!!! You just won't believe it yourselves. The president of your telemarketing firm told me that you are a small company. You have made my hair grow. Now I would love to help your company grow. Consider me a testimonial for your next infomercial so we can reach all those women who are suffering quietly. Until now, I don't think they had anywhere else to go! I love you-I love you-I love you.